This is little Christine Joseph and her mother. Christine first came to our attention on May 26th when Mustard Seed Haiti (the Haitian team) received a call from people at St-Helene for another baby. They took her to the hospital where the doctors said she was so weak she would have to stay for a few days. As of last night, she was still at the hospital. 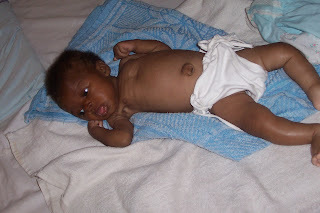 Mustard Seed Missions is covering the cost of hospitalization for this little newborn. As you can see, when one is hospitalized in Haiti you often have to bring your own things in order to be able to care for your sick loved one. It's encouraging to see that Christine's mother is able to nurse her. 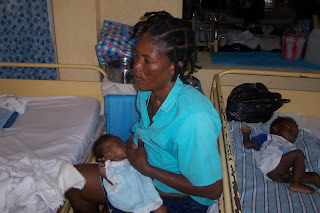 Often mothers are so poorly nourished that they cannot breast-feed.